You’ve written your family history… and you want to self-publish, either just for your family or for sharing with others. So how should you present it? Here are a few pros and cons about the various format types and how they can be used. There are a few CD creation software programs, but you can just do it yourself, making sure to save documents to it in PDF format (for easiest readability), and/or WAV format for audio files. Video files can be saved to play from the CD, or you can link out to YouTube, where you can establish a private video channel that is not searchable from the main site. PDFs – These are very easy to develop, right from most word processing software programs. Once you’ve got the layout you like, just “Save As” PDF and voilà, you have something you can easily email to your relatives, print a few copies of on 8x11 paper and spiral-bind, or upload to social media. The nice thing about PDFs is that you can make them interactive by embedding hyperlinks; that way, it’s easy for readers to visit websites, see video, or listen to audio files that correlate to the document. HTML/blog or website – Create your own website with all the detail on your ancestry. Getting a domain name that reflects your family name is always a good idea (like Johnsonfamily.com), because then each page you add can be designated a subdomain for easy indexing (like Johnsonfamily.generation2.com). Any documents you want to share can be saved as HTML files – even from word processing programs – which allows you to cut and paste right into your website development software. 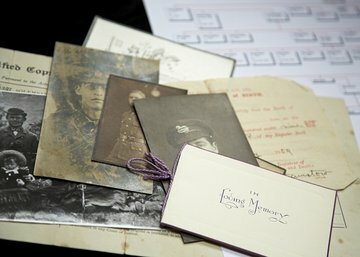 There are other websites you can upload your family history to, as well. Or, if you can find a local university or library (like the Darien Library, in Darien, CT) that has their own Espresso machine; it’s easy to print just one copy for about $10, while you wait, complete with cover! • Get more self-publishing advice from Selfpublishedauthor.com for writing, editing and publishing advice, and get your ISBN number from myidentifiers.com. • Take a look at the Family History Month page at ProQuest.